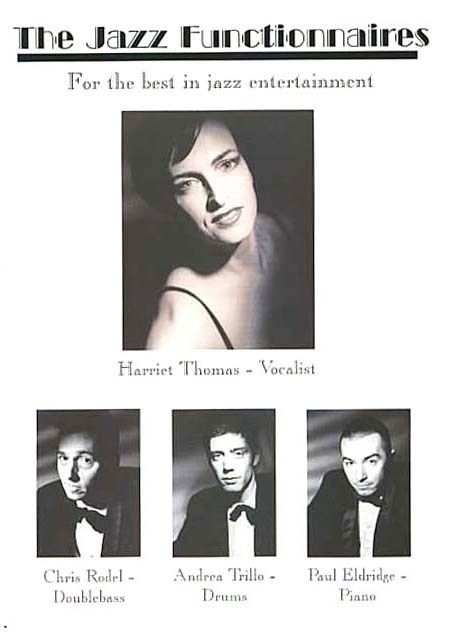 Classic jazz quartet fronted by stunning vocalist Harriet Thomas, backed by double bass, piano and drums. Perfect for mellow background or uptempo dance music. A trio (instrumental, or with vocals) is available and Harriet can also perform with just a pianist, or larger ensembles where space and budget allow. As its name suggests, The Jazz Functionnaires specifically formed in order to provide high quality jazz entertainment at corporate and private functions. All four musicians are experienced professionals, having worked extensively in the jazz and function field, as well as being involved in radio, television and session work. They have a wide repertoire of classic jazz tunes that everyone can enjoy, so you don’t have to be a jazz buff to appreciate their sophisticated yet accessible music. Let The Jazz Functionnaires help you to create a truly memorable event with the ever popular sound of ‘dinner jazz’: the perfect music to wine, dine and dance to.